In 2017, AMPO mobilized a working group to serve as a focal point for metropolitan planning organizations (MPOs) to engage with the U.S. Department of Transportation on vehicle connectivity and automation. While the pace of deployment for vehicle connectivity and automation is uncertain, eventual deployment sometime in the near future is inevitable. Therefore, it is essential for those agencies responsible for planning, constructing, maintaining, operating, and funding the transportation system, including MPOs, State Departments of Transportation (State DOTs), transit agencies, local governments, and toll facility owners and operators to be engaged in discussing the timing and implications of this new technology for the planning process, system performance, and investment decisions. To facilitate the deployment of this technology, which could have profound effects on our landscape and mobility, new roles and responsibilities are being defined and new and/or modified planning tools and analytic techniques are under development. New technical, institutional, and policy issues associated with deployment of vehicle connectivity and automation will continue to emerge as deployment moves from test beds to general use applications. A mechanism for MPO engagement, communications, outreach, and capacity building to monitor and support the US DOT’s vehicle connectivity and automation programs could add substantial value to their vehicle connectivity and automation outreach and deployment initiatives. Awareness of guidance, issues, and deployment status will benefit state, metropolitan and local transportation planning agencies with responsibility for planning and delivering federal-aid transportation programs and projects. A roadmap could help define the current and desired state of the practice, identify knowledge gaps in responding to infrastructure needs and leveraging system performance, safety and environmental benefits, and recommended steps and actions for incorporating vehicle connectivity and automation into projects and the performance-based planning and programming process. Provide a mechanism to build technical, institutional, and policy capacity of MPOs and their partner state and local agencies to leverage the benefits of deployment of vehicle connectivity and automation to the performance based planning and programming process. Address knowledge gaps and provide a forum for MPOs with their partner state and local agencies engaged in transportation planning to educate and expand awareness of the nature and status of vehicle connectivity and automation deployment, current and emerging technical planning issues, and institutional and policy challenges. *Coming Soon in April 2019! * Please join us on April 25, 2019 from 2:00-3:30pm EST for a webinar that will share the AMPO National Framework for Regional Vehicle Connectivity and Automation Planning. It will also allow you to hear from working group members as they provide an overview of the AMPO Working Group on Vehicle Connectivity and Automation and share perspectives from their MPOs. To register for the webinar click here. This document is intended to provide a framework (Framework) as MPOs incorporate vehicle connectivity and automation into their metropolitan transportation planning process and work to guide its deployment to help meet regional transportation needs and goals. As advancements in technology are occurring at a fast pace, the Framework will be a working document that provides an initial step to exploring the many factors that will shape deployment. The Framework’s recommendations focus on the aspects of vehicle connectivity and automation that are within the responsibility of MPOs and the scope of the metropolitan planning process. The working group held four meetings, which culminated in a national symposium. The meetings focused on MPOs, but included MPO partners, such as State DOTs and industry. The objective of these meetings was to develop a framework to increase awareness among MPOs, State DOTs, and local transportation agencies of transportation planning-related vehicle connectivity and automation issues, opportunities and challenges, and implications for the transportation planning process. 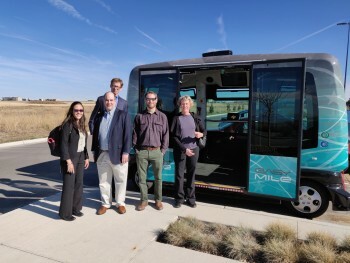 The meetings provided the USDOT with a mechanism for outreach on vehicle connectivity and automation planning-related guidance, and program and policy initiatives. The meetings provided an opportunity for MPOs to discuss and identify the necessary training, information, and tools for deployment and implementation. In addition, they allowed participants to build technical capacity, identify the state of practice, and develop effective practices. The products and materials developed by the work group, including the white papers, were presented at a national symposium and peer exchange on regional vehicle connectivity and automation planning hosted by AMPO. AMPO prepared four white papers on vehicle connectivity and automation based on the working group meetings and recommendations from the USDOT and Federal Highway Administration (FHWA). Work group members were selected to represent the diversity of MPOs nationwide and based on existing efforts in vehicle connectivity and automation at the MPO. The size of the work group is limited by the available travel funding. The Working Group held its first meeting from April 4-5, 2017 in Arlington, Texas. The group was hosted by the University of Texas at Arlington’s College of Architecture, Planning, and Public Affairs. This meeting identified current policy, practice, and activities at MPOs, challenges and needs, opportunities, and next steps. -Read-ahead Packet from Meeting #1 – Compilation of existing/ongoing CV/AV efforts at various government agencies, institutions, and private industry. The Working Group held its second meeting from July 31 – August 1, 2017 in Cincinnati, Ohio in coordination with the American Association of State Highway and Transportation Official’s (AASHTO) Conference on Performance‐Based Transportation Planning, Financing, and Management. The meeting focused on the opportunities and challenges of navigating regulatory concerns in vehicle connectivity and automation development and implementation, partnership opportunities between State DOTs and MPOs, and the risks associated with deployment and implementation. For more information on the AASHTO Conference on Performance‐Based Transportation Planning, Financing, and Management click here. The Working Group held its third meeting from November 13-14, 2017 in Washington, DC. The meeting included AMPO’s federal partners in the United States Department of Transportation and United States Environmental Protection Agency along with a diverse group of AMPO’s peer agencies. The objective of the meeting was to identify the roles, responsibilities, relationships, and opportunities for collaboration. The Working Group held its fourth and final meeting from March 5-7, 2018 in Orlando, Florida. The meeting discussed the relationship between MPOs, States, and Federal agencies and the private sector and establishing effective partnerships and coordination practices among them. The Working Group held a Peer Exchange/Symposium from November 14-15, 2018 in Denver, Colorado. The primary purpose of the meeting was to discuss the draft National Framework for Regional Connected and Automated Vehicles Planning developed by the working group. Additional materials for this meeting will be added by early 2019. 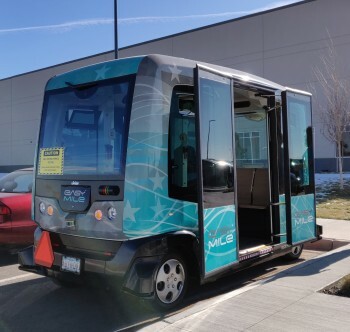 The group was also able to participate in a demo of EasyMile’s 61AV Driverless Shuttle.